On February 5, 2019 Weston & Sampson was awarded two Engineering Excellence Awards during the 2019 American Council of Engineering Companies of South Carolina Engineering Excellence Gala at the USC Alumni Center in Columbia, SC. Many representatives from our SC team were on hand to receive the awards for both projects, the "BCWS PS001 Rehabilitation" for Berkeley County Water & Sanitation and "Church Creek Stormwater Basin Study” for the City of Charleston, SC. 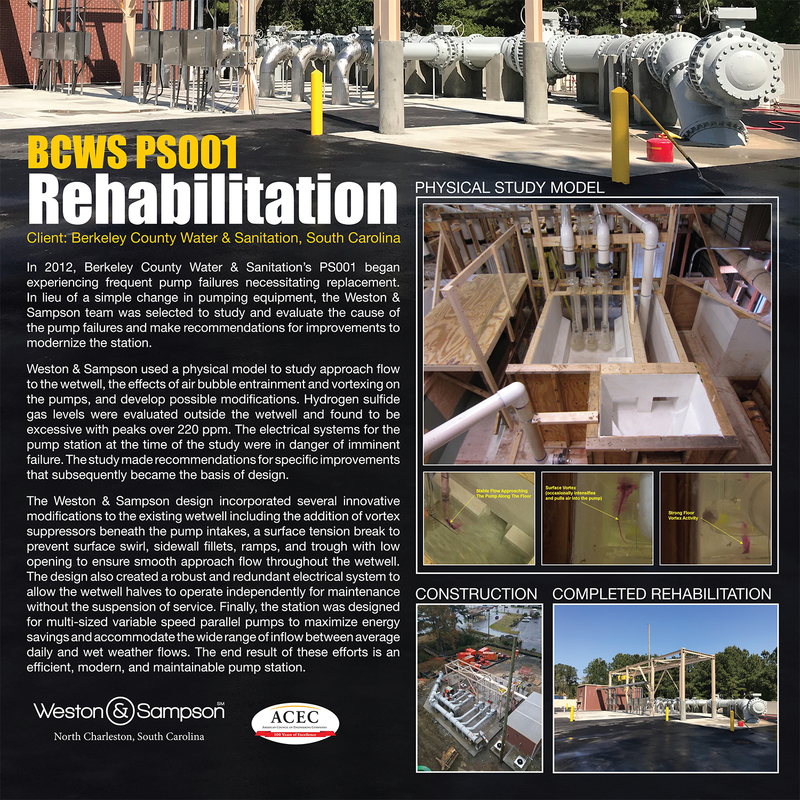 In 2012, Berkeley County Water & Sanitation’s Pump Station 001 began experiencing frequent pump failures necessitating replacement. The Weston & Sampson team was selected to study and evaluate the cause of the pump failures and make recommendations for improvements to modernize the station. Weston & Sampson used a physical model to study approach flow to the wetwell, the effects of air bubble entrainment and vortexing on the pumps, and develop possible modifications. Hydrogen sulfide gas levels were evaluated outside the wetwell and found to be excessive with peaks over 220 ppm. The electrical systems for the pump station at the time of the study were in danger of imminent failure. The study made recommendations for specific improvements that subsequently became the basis of design. The Weston & Sampson design incorporated several innovative modifications to the existing wetwell including the addition of vortex suppressors beneath the pump intakes, a surface tension break to prevent surface swirl, sidewall fillets, ramps, and trough with low opening to ensure smooth approach flow throughout the wetwell. The design also created a robust and redundant electrical system to allow the wetwell halves to operate independently for maintenance without the suspension of services. Finally, the station was designed for multi-sized variable speed parallel pumps to maximize energy savings and accommodate the wide range of inflow between average daily and wet weather flows. The end result of these efforts is an efficient, modern, and maintainable pump station. 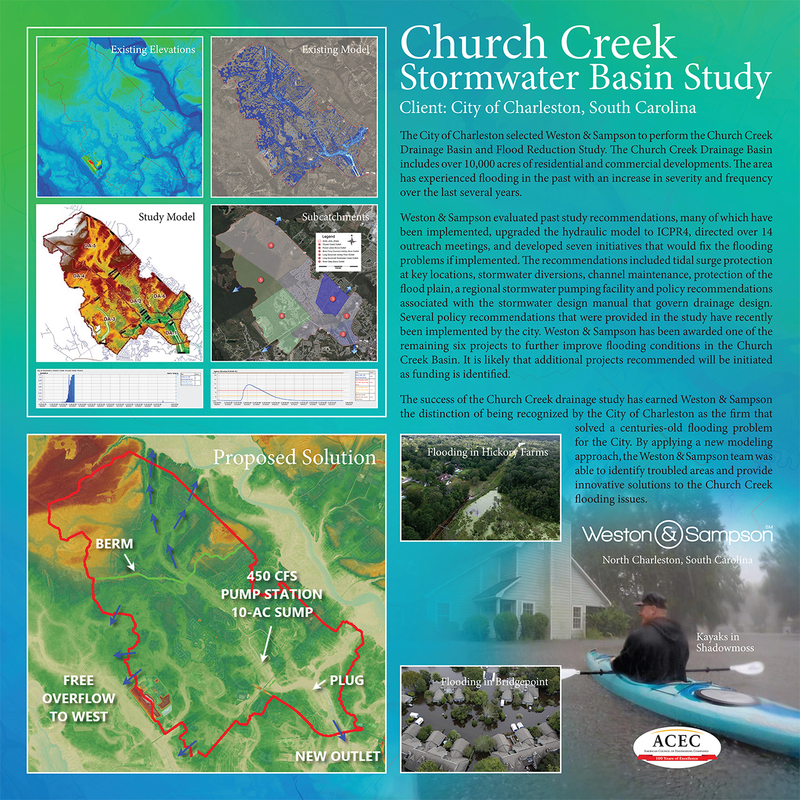 The City of Charleston selected Weston & Sampson to perform the Church Creek Drainage Basin and Flood Reduction Study. The Church Creek Drainage Basin includes over 10,000 acres of residential and commercial developments. The area has experienced flooding in the past with an increase in severity and frequency over the last several years. Weston & Sampson evaluated past study recommendations, many of which have been implemented, upgraded the hydraulic model to ICPR4, directed nearly 20 outreach meetings, and developed 7 initiatives that would fix the flooding problems if implemented. The recommendations included tidal surge protection at key locations, stormwater diversions, channel maintenance, protection of the flood plain, a regional stormwater pumping facility and policy recommendations associated with the stormwater design manual that govern drainage design. Several policy recommendations that were provided in the study have recently been implemented by the city. Weston & Sampson has also just been awarded one of the remaining six projects to further improve flooding conditions in the Church Creek Basin. Additional projects recommended will be initiated as funding is identified. The success of the Church Creek drainage study has earned Weston & Sampson the distinction of being recognized by the City of Charleston as being the firm that solved a centuries old flooding problem for the City. By applying a new modeling approach, the Weston & Sampson team was able to identify troubled areas and provide innovative solutions to the Church Creek flooding issues. Posted in Awards, News, Newsletter, Press Releases, South Carolina Engineering, Top News and tagged stormwaternews, wastewaternews.